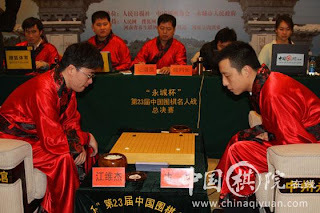 Jiang Weijie (5 dan) successfully laid his final blow at Gu Li Mingren. After a hard 5 games, Jiang Weijie became the new Mingren. Game 3 started at November 29. Jiang Weijie managed to extend his victory from game 2 and led the series by 2-1. Gu Li found himself in a hard spot after Jiang Weijie cut his group with 89 by breaking the "rule" of "never cut two iken tobi stones". Jiang then put more pressure at Gu Li's group. 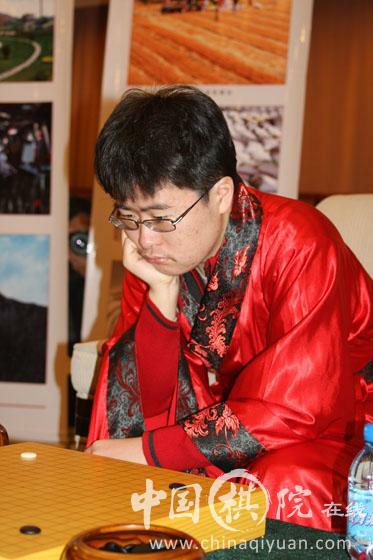 Gu Li resigned at move 215. He was about 6 points behind (including komi). At the fourth game, Gu Li showed what he was made of. Gu Li showed a new plan (at least for me) up to move 28. Gu started his attack by playing the attachment at move 109. Jiang must have confidence when he played W114. However, Gu played it right and successfully trapped the group. Gu's position became very thick and he launched his second attack at white's weak group at the left side. Jiang resigned at move 219 because his group at the left side was helpless. The final game was played a December 2 with Gu Li played black and Jiang Weijie played white. During the opening, Gu got a big territory at the right and bottom side. However he got a group to watch for at the center. Jiang managed to capture black's weak group at the center and later found a nice move (move 174) that wrecked black's territory. This is the first big title for 19 years old Jiang. 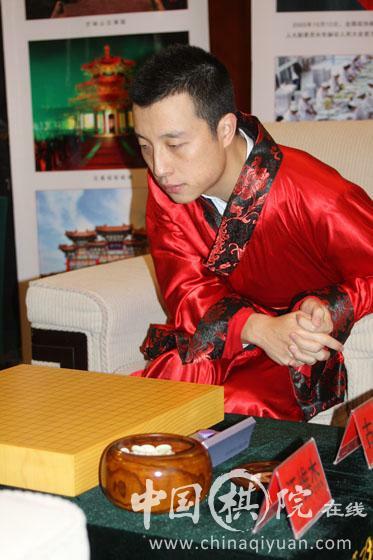 Previously he has won Ricoh Xinxiu cup in 2008, National Go Individual in 2009, and became runner-up at Quzhou-Lanke Cup in September 2010. Wow he's the same age as me. Amazing. Let's see if he will become a force in the future like Japan's Iyama Yuta. Copyright © IGO THE UNLIMITED GAME. All rights reserved.